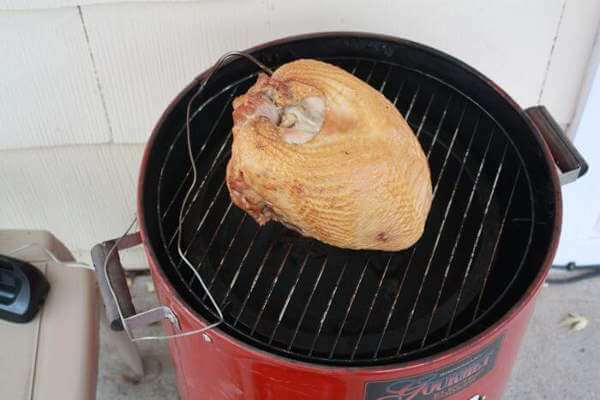 When you smoke a turkey breast in an electric smoker, especially if it's a vertical electric water smoker, the smoker needs to be set up a little different than usual. Turkey cooks great at a higher temperature than you'd smoke beef briskets or pork shoulders. The reason is that turkeys and other poultry don't have tough connective tissue and fat-laced meat like beef and pork. Connective tissues and fat require low and slow cooking in order to break down, and that takes heat and time to accomplish. In order to get the smoker temperature up, I use my vertical electric smoker with no water in the pan. Instead of heat energy being used to turn water into steam, it's all available to cook that turkey breast. Set the smoker up in a wind free location. Put up a windscreen of some sort if necessary. A strong breeze prevents just about any smoker from heating up to its maximum temperature, and with some electric smokers, like the under powered Brinkmann Gourmet electric smoker I have, it really causes problems. Remove the water pan from its normal position, below the lower food rack. Put the rack back into position. 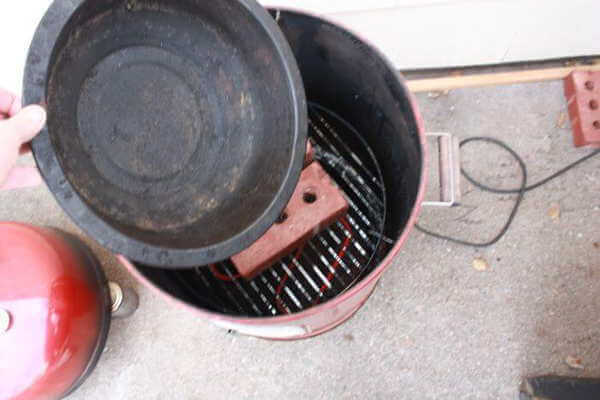 Place two concrete paving blocks or red bricks on the lower rack, then place the empty water pan on top of the bricks. The water pan makes a dandy container to catch the drips. Put the upper food rack into position. There should be plenty of room left above the top of the water pan for the rack to fit into place. If not, use thinner bricks. Put the lid on the smoker and preheat it to between 275 to 300 degrees Fahrenheit if it'll go that high. The Brinkmann I have will only get up to 225 degrees on a warm, windless day. Like I said before, it's severely under powered. 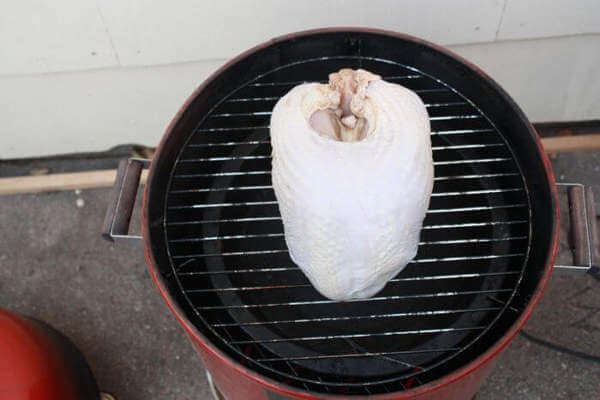 When the smoker is up to temperature, place the brined, seasoned turkey breast on the center of the upper rack. Insert a remote thermometer probe into the center of one side of the breast. Carefully put the lid into position without damaging the probe lead. 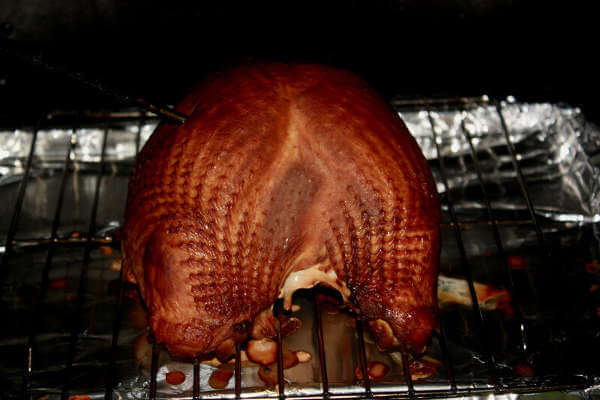 Continue smoking the turkey in the electric smoker until its internal temperature reaches 160 degrees. Turkey is safely done at 165 degrees, but the internal temperature will continue to rise a bit after removing it from the smoker. Remove it from the smoker, wrap it in aluminum foil and let it rest for 10 to 15 minutes before slicing to serve.